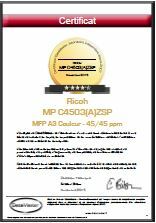 The Ricoh C4503(A)ZSP, C4503ZSP and C4503(A)SP range of multifunctions has been scrutinized, analyzed and assessed in the DataMaster lab. It was awarded an evaluation certificate with the excellent score of 4.5 / 5 Stars. The laboratory especially appreciated the very wide range of features and functions of these MFPs, the best in their market segment. In addition, the analyses demonstrated the overall flexibility of these machines. The only downside is that, despite the ability to print in 1200 x 1200 dpi, the print quality is only average.